It's time once again for our monthly Xbox Live Co-Op Night, a great chance to beef up your friends list, make new friends, and get those pesky achievements you've been trying to obtain. 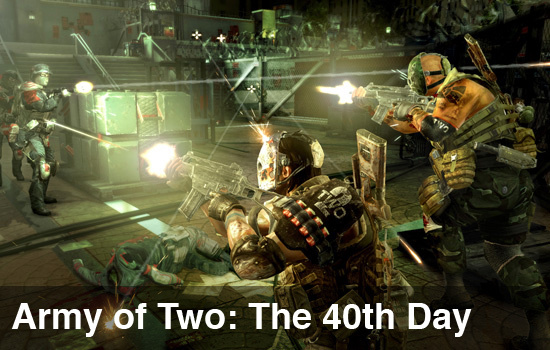 This month we're playing Army of Two: The 40th Day in both campaign and Extraction modes. Play as Salem or Rios through the game's campaign with another friend. Co-Op snipe, cover each other, use aggro and more as you encounter a war torn Shanghai. Moral decisions can play a part of your unlocks and progress. Also available is a unique mode called Extraction which allows four players to team up against the AI and rescue VIPs. Activities kick off at 8PM Eastern time on Thursday, January 28th. The Co-Opticrew, community and even some of the Army of Two team will be playing! Leave your gamertag below if you plan on playing, or confirm on our Facebook event page. By doing so you are automatically entered to win one of four prize packs. Prize packs contain one or more of the following! And don't forget you still have time to win a code for Extraction if you didn't get one yet!